CFOs that need to hop from country to country as their companies expand into growth markets are finding increased flexibility and value in business jet chartering. FDE climbs into the cockpit with Ashley Namihas and Florent Sériès of TAG Aviation Europe. 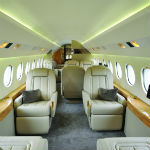 In a climate of global austerity, the capital intensity and extravagance of owning business jets has caught up with many of the larger multinational companies that traditionally use them. In 2009, for example, Citi and RBS had to cancel orders for Falcon 7X business jets following pressure from regulators and naysayers. The need for business jets and a corporate flight department continues, however, as companies pursue new geographic markets and tap a wider, more global investor community. Executives are under pressure to pack in as many stops as possible in order to visit as many stakeholders as they can. Conventional commercial carriers with all the associated transfers, queuing and delays simply can't cut it. TAG Aviation, a key player in the chartering space, has responded by adapting its services to offer the equivalent of a corporate flight department on demand, but with none of the up-front financial commitment. "The cost-to-value ratio for flying a business jet to three cities in one day with your IPO roadshow team hasn't changed," says Ashley Namihas, area director for TAG Aviation Europe Charter Services in the UK. "There is still no better option, especially when we see how few good deals are out there and how many more people are chasing them." Among the three offers TAG has created is the TAG Account. In this case, the company sets up a personal profile of clients' business jet travel needs for frequent and predictable flyers, and a phone call will assure an aircraft is available. Unlike other programmes of its kind it carries no expiration date and deposits are refundable if travel plans change. The second offering, Call and Fly, allows a personal assistant to call the company's charter line on a trip-by-trip basis to book a private jet. Rounding out the portfolio of offers is the TAG Lease, designed for clients who might otherwise purchase an aircraft, but who prefer to have all the complexities of ownership handled by a provider. "Differentiation is valued even in something as regulated as business jet charter," observes Florent Sériès, vice-president of charter services for TAG Aviation Europe. "Our clients appreciate our distinctive approach to meeting their different needs. We offer a level of experience that helps resist economic cycles." Unlike a simple aircraft charter operator or broker, TAG Aviation's multiple offers are made possible through its diversified operating model. For over 40 years it has not only chartered jets, but also kept its own fleet and managed them for owners. TAG also maintains its own and clients' jets at its fixed base operation (FBO) facilities at TAG Farnborough Airport in the UK, Geneva and Madrid. Even with that diversified approach, TAG Aviation has been able to maintain operating standards that rank high among the industry. "Last April we received the European Business Aviation Association's (EBAA) prestigious 2012 Platinum Safety of Flight Award," Namihas says. "This safety award honours a European operator surpassing 50 years or 100,000 hours of flight without an accident." With TAG Aviation UK ranking in the top five of every UK air operator's certificate holdings, as well as winning Wyvern Wingman status this year, the future looks positive in an industry adapting to a changing market. Business jets offer proven cost benefits to corporates looking to expand into new geographic markets.